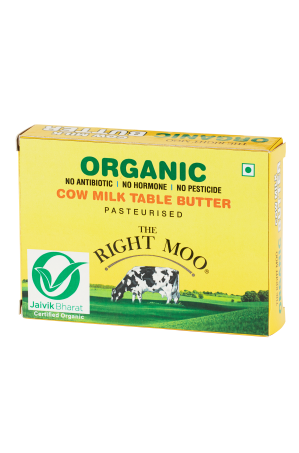 Organic Butter contains Omega 3 and Omega 9 essential fatty acids along with vitamins A, D, E and K. Organic butter of pastured cows is one of the highest natural sources of CLA (Conjugated Linoleic Acid). 9 phenolic anti-oxidants, as well as numerous other minerals are present in ghee. Made from milk untouched by hand from Holstein-Friesian cows fed Certified Organic feed. No Pesticides, No Urea, No Aflatoxin M1, No hormones, No antibiotics, No GMOs, No heavy metals. © 2019 Arrowline Organic Products Private Ltd.